Popular fashion retailer Gap has come under fire for an advert that has been described by parents on social media as an example of ‘disgracful sexism’. The ad, which currently appears on the Gap UK website, features a boy and a girl dressed in Gap Kids clothes. 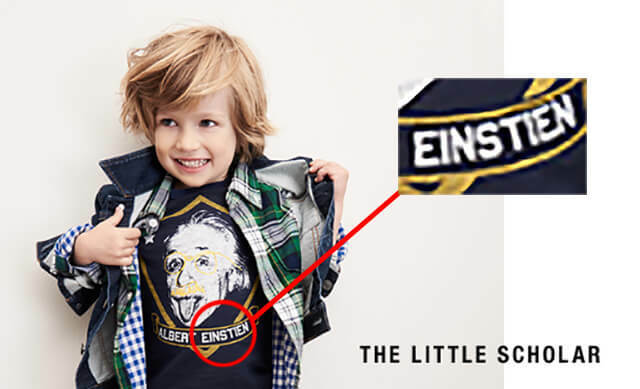 The little boy, who is modelling grey tracksuit bottoms and a navy Einstein T-shirt, appears under the strapline: ‘The Little Scholar: Your future starts here’. The girl, however, is dressed in a cream jumper and black bottoms, with the headline: ‘The Social Butterfly: Chambray shirts + logo sweaters are the talk of the playground’. The campaign has been heavily criticised on social media, with one user suggesting that “social butterfly” be swapped with “literary badass”. Thinking @UKGap should swap social butterfly for literary badass for alternative aspirations for girls. Maybe I’ll mock one up. It is yet to be seen whether Gap will remove the adverts after the backlash, or indeed change the spelling on the t-shirts.